First of all, this is a non-destructive form of protest. If this was spray paint I would be upset. My question is that how would you feel coming to work to this? The workers did not make the plans but are just trying to make a living. My first instinct would to be clean it up so the workers who are powerless in the situation don't have to deal with this. On the other hand people are obviously upset and want to send a message to those who do make decisions - so I want to respect that. I will leave it to the community to figure this one out. Btw, I have no real opinion on the work being done. Where is this? The Marinwood/Miller Creek intersection ? Probably the wrong place to put this. The workers are just being paid by the contract/money allotted. Better to send emails/letters to the county folks who made the decision. I think it is a perfectly harmless - and effective - display of taxpayer dissatisfaction. I find it totally understandable, but that's me! I would prefer it if people contacted their supervisors (and all other elected officials) and complained, commented and questioned in advance, but most don't until it's too late. Involvement is the only way to get and keep things on track. Bravo to the brave resident! By the way, the workers might well agree with the chalked sentiments. It shouldn't bother them in the least. I think it's a little messed up. I mean I get that this person might think it's a waste but what about the disabled people in our neighborhood who can now safely cross the road. Not sure if this person noticed that that place had no wheel chair ramp before. Actually our neighborhood isn't very wheel chair friendly. I have many times seen a little girl in our area have to use people's driveways to cross the street ect. Just a thought. I find it obnoxious and ineffective. Contact your County officials if you don't like it, but don't vandalize public areas. ""Susan Mortensen of Richmond, Virginia was reprimanded by a James River Park officer when she allowed her four-year-old daughter to color rocks with sidewalk chalk. Ralph White, park manager, told news reporters that chalk is no different than spray paint, and is akin to any other type of vandalism, saying, “It doesn’t matter what the medium is. It’s offensive”. On Tuesday, a judge ruled to dismiss charges, after sentencing Mortensen to 50 hours community service. Additionally, Mortensen is expected to pay a fine of $325, and faces a ban from all city parks. In response, angry protesters drew on the courthouse sidewalk with chalk. 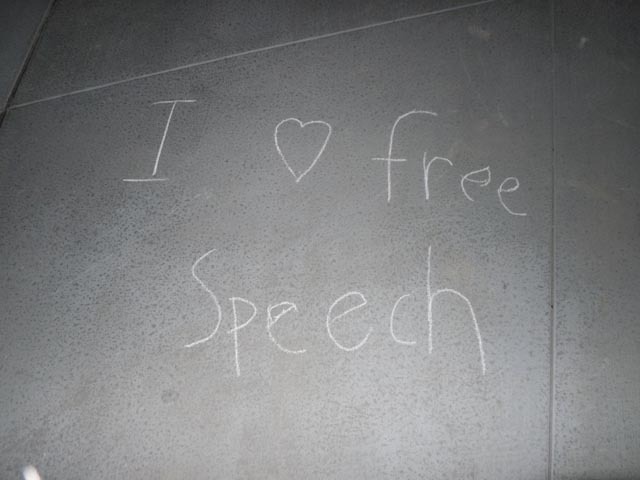 Many feel comparing chalk, which washes away with water, to graffiti is going too far. Just curious - does anyone know the Marin County law about writing with chalk on sidewalks? Editor's Note: After seeing the ridiculous outrage from some of our more notable citizens, I had to see it myself at the corner of Marinwood Ave and Miller Creek Rd. Some guardian of public morals and decency rubbed out the offending chalk protest. Naturally, as a defender of free speech, I had to add some comments of my own. Many people believe that all of the construction going on at the Civic Center, including the 'roundabout', are a waste of taxpayer monies, too. I'm one of them. With 18 proposed new taxes on the upcoming ballot, I think it's valid to question how the monies are being spent. Don't you? This chalk on a sidewalk is nothing to get so heated about. It will wash off, yet it made someone feel better putting it there. What's the harm? The last few pictures show that the insults are directed at the workers -- "You get paid, we get bad workmanship." "Bad Job. Shame on you." Those are inappropriate... if the comments were restricted to "Waste of tax dollars", then the protest might be ok. But the comments directed at the workers are not ok. There is no evidence to believe that any bad workmanship is in play here. Just in terms of chalk in general - not THIS particular chalk - it is NOT vandalism as it washes off easily - will be gone in a rainstorm. My children used to play hopscotch, and draw pictures on the sidewalks. I see things drawn by kids on sidewalks all the time. Don't we have a whole Italian street drawing festival in San Rafael with chalk? This is in response to the ridiculous article Linda Barnello quoted (I am NOT calling Linda ridiculous, but the fact that a woman was fined for letting her four year old draw with chalk). @Lydia - Thanks for clarifying "WHAT" was ridiculous about theparenting.com article. I thought the "banned from all city parks" was over the top as well. Parents want to get their kids outside to play, instead of getting used to watching tv! Parks are a great place to play. @Paul - I agree that those insults directed at the workers was poor judgment. Typical useless passive-aggressive approach. Only makes Marinwood residents appear like entitled jerks to the construction workers trying to make a living. The chalker should grow up and either say it to their faces or speak/write to someone who actually makes decisions. It's not vandalism because it will rinse off, but it is rude, cowardly, and ultimately ineffective. Cowards, put your name to it. By no measure should this protest be considered effective or brave. The funds for this work came through a federal grant (not County or local funds) for bike and pedestrian safety improvements. All this protest is, is insulting to the County workers working hard who have simply been doing their job. Money from any government entity is, in fact, taxpayer funding. It's ridiculous to attack someone who simply wrote his displeasure in chalk. There are much bigger issues to get heated over. It is not "ridiculous" at all. No more ridiculous than teaching your children to respect public property (i.e. vandalism is wrong) and teaching your children to treat others as you would want to be treated. Fairly universal guidelines of how to get along in society. I am so saddened to think that there are really people in this (family!) neighborhood who would be anything but thrilled to see that work is being done to ensure that our pathways are safe and accessible for ALL. We live on Miller Creek. I invite anyone who thinks that any of this is a 'waste' to come for a walk with our family and just see what happens when you encounter curbs with no cutouts,major, busy roads with no accessible medians or walkways .......when you're in a power wheelchair. We cannot go in either direction from our house and cross a road without encountering an accessibility issue. My daughter cannot safely access the community center, Marinwood Market, or our local school. It's that basic. By the way, she is far from being the only person in a wheelchair in our neighborhood, but she may be one of the few you see daring enough to put themselves out there in our inaccessible neighborhood!!! I am going to be thrilled to see EVERYONE, with or without wheels, crossing roads and walking our neighborhood safely. We have gone from one person's completely removable protest to the value of the project and/or the feelings of the workers. The project itself is likely very worthwhile, but I personally see no harm in a chalked protest. I wonder how most would react if someone chalked "NOT HERE!" on the Mark Drive building proposed for a year round homeless shelter. I think it is completely rude and not the right place for protest. The construction workers have nothing to do with the decision to implement this - what an awfully negative message to be greeted with at work. They've also put up cardboard signs multiple times. I am tempted to put up some chalk messages thanking the workers for making these improvements to our neighborhood - and for sticking to the schedule and getting it done so quickly. Seriously, complaining about EVERYTHING, including small improvements like these, makes it so we are taken less seriously when we have bigger issues to address. We will be known as the neighborhood who complains about any little change. Clearly the person who did this has never watched a person in a motorized wheel chair try to navigate a sidewalk without an easily accessible approach. You might think it's a waste, but I'm sure our disabled neighbors who struggle to get around are probably over the moon about the improvements. We are a family community, and we should be doing what we can to make it safe and accessible for everyone. @Jody - although the chalk is removable, the messages that are lobbed at the construction workers are rude and inappropriate. "You get paid and we get bad workmanship." How is that ok? If they had simply stopped at "Waste of Tax Dollars", well ok, that's tolerable and at least isn't aimed directly at the construction workers. But when you call into question the workers by saying "bad job" - and "bad workmanship", then you're crossing a line. Many of us agree that the SMART train is a waste of tax dollars too -- but walking up to one of the construction workers on the tracks or the stations and insulting them isn't the right thing to do. It strikes me odd that this was done, and makes me wonder -- was this a bunch of kids just parroting what they heard their parents say? Or was this actually adults drawing in chalk? I have my reservations about the project and aspects of its design that I don't like and I think will cause problems, and perhaps even accidents. But I'm not going to insult the constriction workers on site. I have to say, that while I stand by my statement that the chalk in and of itself is NOT vandalism - SO easily removed, and my kids have drawn pictures in chalk on sidewalks in front of our homes many times (and that's public property) I think that Paul is right that the sentiment here was misguided. The workers are just implementing what they have been instructed to do, and as far as I can tell, the workmanship is fine. I do think the actual sidewalks constructed are wasteful. Although I am not in a wheelchair, I had twins in a stroller for many years and I am well versed in the importance of easily maneuvered curbs. And these curbs seemed fine. And it's not even that - it's the huge bump out which cost money and time and will ultimately be a pain in the posterior for those of us who live in the Blackstone/Deepstone/Heatherstone area. But again, that is in no way the fault of the workmen. They have worked VERY hard all summer in some lovely heat, and I don't envy them that! 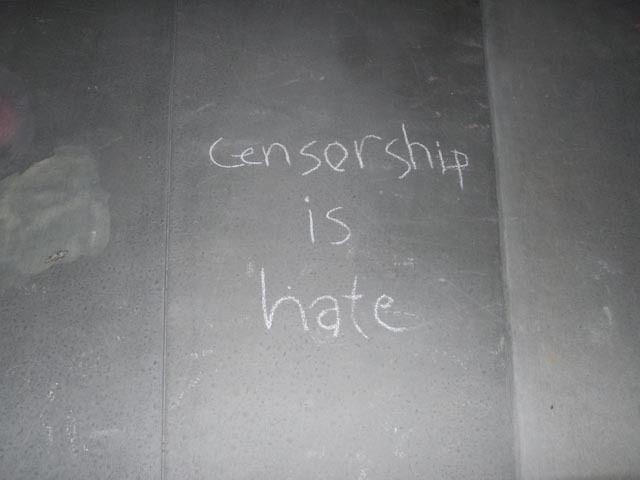 Well, unfortunately some of us who have defended the construction workers and condemned the chalk comments are now being vilified in the public blogosphere as being in favor of censorship. So I would recommend this thread get shut down. Already every post/reply above, including our names, and links to profiles has been published outside this forum, and our opinions judged. It's such a shame that one of our own neighbors feels the need to copy/use a thread like this for negative purposes instead of positive. Editor's Second Note: The above poster Paul Brunell is incorrect about personal profiles being linked. If someone is not a member of Marinwood Nextdoor they cannot access your profile. No responses were altered from the original content. I am not quite sure why my opinion on free speech is "vilifying" anyone. You can make your own judgement if Paul is being fair. Clearly, he wants to censor this post and this website. Welcome to the most dangerous website in Lucas Valley! 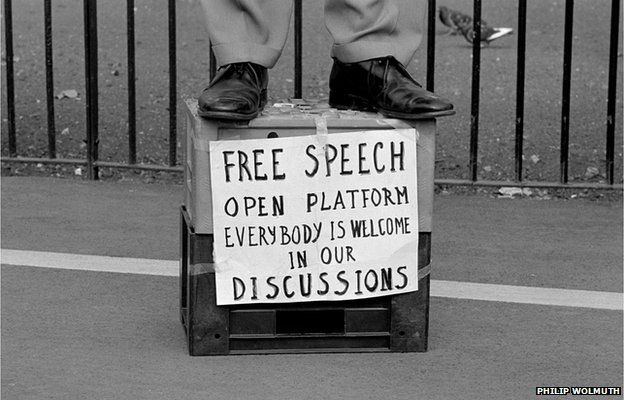 It's funny that you support anonymous free speech on sidewalks but call people cowards and censor it on your own site. Hypocrite much? Not at all Paul. The reason I don't publish your anonymous rants which often are personally antagonistic towards me is that it is impossible (and worthless) to have a conversation with someone who cowers behind screen names. For example, your last comment above is more or less typical of the over the top assertions you make. I am quite happy with hearing from different points of view. Why are you so threatened by it? Why do you censor your videos that you show to the public? Hiding facts to present one point of view, your own, is the very meaning of censorship and you do it all the time. You can't oppose censorship and then use it as a tool to make your point. HYPOCRITE. So according to you, holding a point a view that you disagree with means the person is a hypocrite? I call that an opinion. There is no media ANYWHERE that is purely objective. You use censorship as a tool all the time and then try to say it's wrong. If it's so wrong why do you use it so extensively? Is it not wrong when you do it? That is the hypocrisy. It has nothing to do with point of view or opinion. If "Censorship is hate" than this blog is full of hate. I find it laughable that someone who posts anonymously, is complaining that their views are being censored because they are not represented. Why not stop whining and put forth an argument for discussion, sign your name and stand by it in PUBLIC? You are a weenie. why have you posted nextdoor conversations on your blog? Do you think that is responsible? Nextdoor has a daily circulation of thousands of people, I hardly think there is an expectation of privacy when you post something online. I think the little "tempest in a teapot" is quite amusing and reveals much about our community and its personalities. Unlike Paul Brunnell who repeatedly attacks me personally, I have not singled anyone out for their views but simply voice my own opinion. So yes, I think it is responsible to engage in open, civil debate. Democracy needs it.